This is how John Cavaliere, the driving force behind Lyric Hall, describes his all-consuming passion. It hasn’t been easy to get here, however. 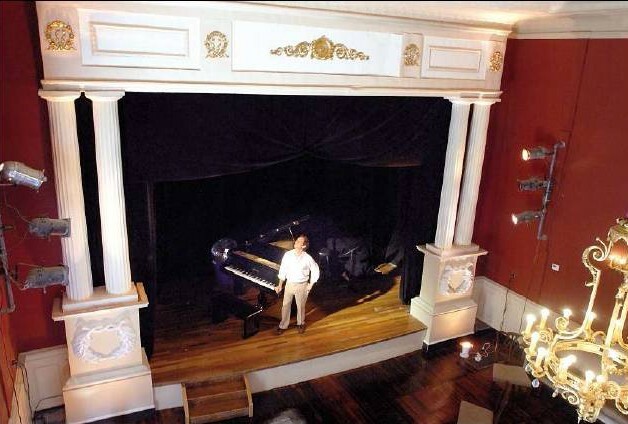 When John purchased the building in 2006, all that remained of the once and now breathtaking theater was a small piece of the proscenium. 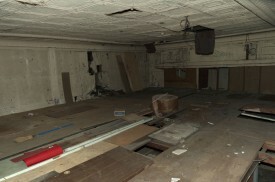 Initially, it had been an extravagant vaudeville outlet and silent movie auditorium, but intervening owners had scrapped the vast majority of its theatrical elements, not seeing the space’s history as integral to their business needs. Tiles were dangling off the ceiling and the hardwood floors were rotting. After repairing the ceiling and floors, John embarked on the most creative aspect of his project: the resurrection of the playhouse space. Fittingly, he accomplished his renovations with pieces of the past. For example, he adorned the balcony with an almond-white balustrade he rescued from the Hyperion Theater, which used to sit behind the Union League Café. But this was only the beginning of the throwbacks. The Hyperion Theater was itself an update of the 1880 Carll’s Opera House and pieces of that historic venue, discarded in its transformation to the Hyperion, have also come to reside in Lyric Hall. Then, on either side of the theater’s stage, matching Doric columns on plinths with Egyptian Revival wreaths invite the audience to join an experiment in wonder. The main bodies of the columns themselves were salvaged from the now demolished porch of the 1842 Root House on Alden Street. Similarly, the wreaths were cast from one that decorated the famous but also demolished Phoenix Building that used to be on Chapel Street and was erected by Grove Street Cemetery designer Henry Austin. But the highlight of the room is the scintillating Beaux-arts crystal and bronze-gilt chandelier that hangs from the theatre’s ceiling, indigenous to an old, distinguished hotel. Despite its present grandeur, however, John can still remember the day he found this circa 1912 artifact in the corner of a junk shop, unloved, near crumbling, and sans ornamentation. It took 6 months to restore it, gild it, and string its crystals in excess of a thousand to bring it to its current state of splendor. But like all John’s work in “the Hall,” as he affectionately calls his theater, the fruits of this labor of heart have been eminently worth the toil. The theater is not the only point of interest on the premises, however. The next time you’re making your way to the side door of the Hall to partake in one of the many intimate cultural happenings, be sure to check out the building’s front door. Longtime Cavaliere friend Peter Wickendon crafted its stain glass using the centuries-old methods of hand-painting mineral pigments on hand-blown glass and cementing the pieces together with lead. The result is a masterwork in which every component is redolent with meaning. 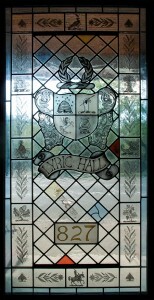 In the center lies Lyric Hall’s heraldic crest with its paintbrush-brandishing hand symbolizing the centrality of handiwork, its bees of industriousness, and its Lyric Hall lyre. Several other symbols dot the perimeter: Acorns of thrift, pineapples that evoke hospitality – perhaps the cornerstone ideal of the Hall – and, of course, the “mystery shippe” of New Haven, a hymn to the town that’s never far from John’s heart. But we won’t give away all the secrets. Have a look for yourself. John’s love for his craft and city are evident in all these details of Lyric Hall. This love will continue to emanate from the many developments that follow in his ever-unfolding delight. We can’t be sure where the place will take us or even describe exactly where it takes us when we visit, but everyone who does agrees they have encountered an enchantingly special place. The text about Lyric Hall was written lovingly by Bryan McCarthy, Dphil candidate at University of Oxford — John’s old friend and apprentice and continued advocate of Lyric Hall. 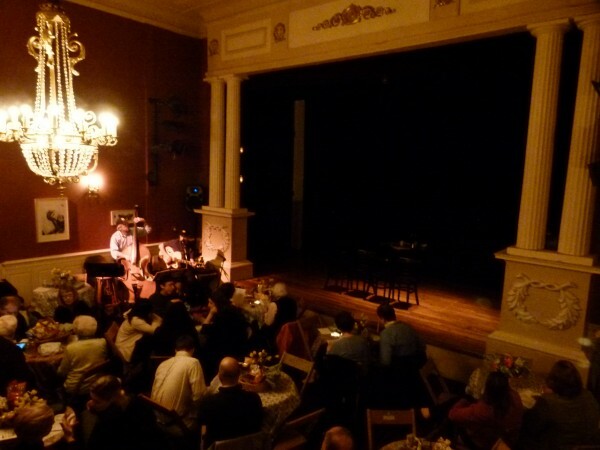 The many who have performed at Lyric Hall, from New Haven’s own Broken Umbrella Theatre to world renowned trumpeter Wallace Roney have embraced the specialness of this venue and all plan to return.